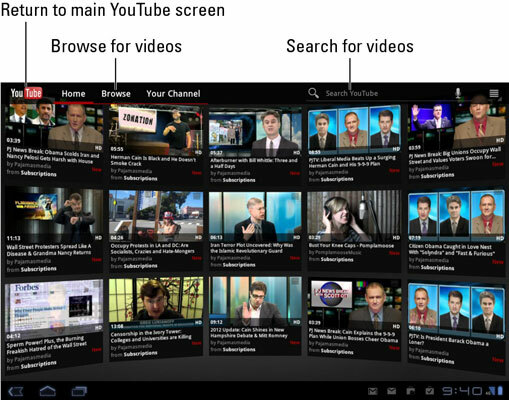 It’s not possible to watch “real” TV on the Galaxy Tab, but a few apps come close. The YouTube app is handy for watching random, meaningless drivel. 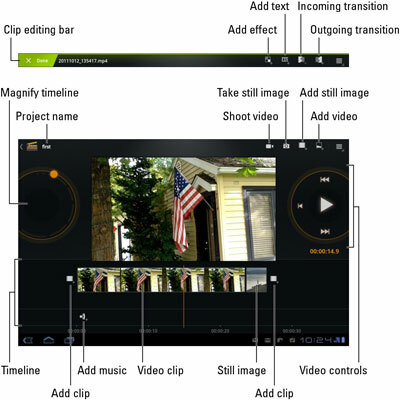 And when you tire of watching someone else’s video, you can create your own movies by using the Android Movie Studio. Forget Hollywood! The Galaxy Tab comes with the Movie Studio app, which you can use to craft your own epic productions. You can mix in still images and videos you’ve already shot (which are stored in the Gallery app), or you can shoot new footage right from within the Movie Studio app itself. The Movie Studio app is actually quite sophisticated for a tablet. Aside from stitching together video and still images, there are filters you can add (called Effects in the program), text overlays, and transitions between shots. You can even add in music tracks and other audio. It’s pretty impressive. Touch the Menu icon button and choose Export Movie to save your project. Touch the Add Music button to pluck out an audio track from the Music app, or from any other music-like app on the Galaxy Tab. YouTube is the Internet phenomenon that proves that real life is indeed too boring and random for television. Or is that the other way around? Regardless, you can view the latest videos on YouTube — or contribute your own — by using the YouTube app on your Galaxy Tab. To view a video, touch its name or icon in the list. Touch the full-screen button to view the video in a larger size. Browse for videos by choosing the Browse category. Or you can search for videos by using the Search YouTube text box. As a suggestion, type a search term for something you’d like to see, such as plane crashes, or people-eating bugs, or disappointing politicians. Touch the Back icon button to return to the main YouTube screen after watching a video or if you tire of a video and need to return to the main screen out of boredom. Use the YouTube app to view YouTube videos, rather than use the Browser app to visit the YouTube website. Because you have a Google account, you also have a YouTube account. To create and upload a video you’ve already shot to YouTube, touch the Your Channel button at the top of the main screen; then touch the Upload button in the upper-right corner of the screen. Use the Gallery to locate a video to send to YouTube.